Rudy, of the Q’eqchi culture, is originally from the Lámpara village in the town of Livingston, located in the Department of Izabal, Guatemala. 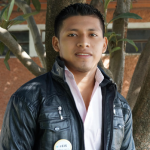 He was selected as a GOJoven Fellow when he was 18 years old. Rudy is an incredibly charismatic young man who is efficient, creative, dynamic, and likes to help others. Rudy has participated in a training workshop on Sexual and Reproductive Health.